This cat guide is here to help people identify the cat they have found and for the owner to list the correct type of cat on their lost poster. 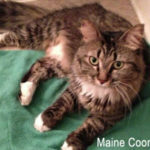 Just yesterday someone posted a notice for a lost calico cat and later sent in the photo which was for sure a grey tabby cat. We’ll start with the most often miscategorized cat varieties. 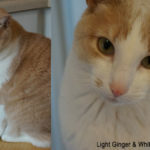 Light Ginger / Orange Tabby Cat with white chest, face and socks. This is Mr. Weasley one of our rescues and we think he’s particularly adorable. A Calico cat has 3 colors that are in distinctive patches throughout the body often with lots of white with splotches of orange and black. Usually, the pattern is not symmetrical. 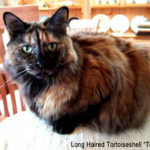 Tortoiseshell cats have brindle coats with patches of red, brown or black, chocolate, cream, or cinnamon. Their owners content they have quite a bit of a sassy personality they like to call Tortitude. So if you like a cat that will give you it’s opinion on everything, this might be the cat for you. They often have a split face. If the base color of a Torbie or Tortie is grey they are called Blue Torbies or Torties if it’s mostly orange they are called Ginger Torbies or Torties. Part Tortoiseshell part Calico cats are known as “tortico” cats and may display a tortoiseshell pattern on the back and tail and a calico pattern on the belly or legs. 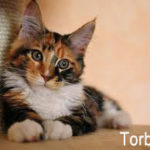 These cats can also have quite a bit of White on them and can be called a Torbie and White. There are also combinations of these cats where both Tortoiseshell and Calico combine and they are known as “caliby” cats. Folklore says Tortoiseshell Cats bring good luck and are sometimes referred to as money cats. The Japanese Maneki Neko figurine is almost always a calico cat. 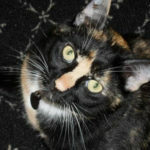 “Tortitude” – The Unique Personality of Tortoiseshell Cats: Fact or Fiction? 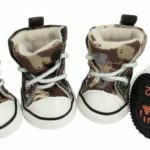 Tabby Cats feature distinctive strips, lines, swirling patterns or dots with a WIDE variety of patterns and colors. The most common mixed breed tabby cats are: Grey Tabby, Orange Tabby and Brown Tabby. They are not a breed but rather a coloration variation that pops up in almost all breeds of cats. They often have white markings on their chest and feet. 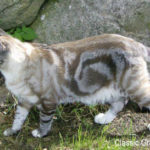 Spotted: The Ocicat and the American Bobtail are good examples of spotted tabby pattern. Agouti (Ticked): The Ticked tabby pattern produces hairs with distinct bands of color on them, breaking up the tabby patterning into a salt-and-pepper appearance. Residual ghost striping or “barring” can often be seen on the lower legs, face and belly and sometimes at the tail tip. 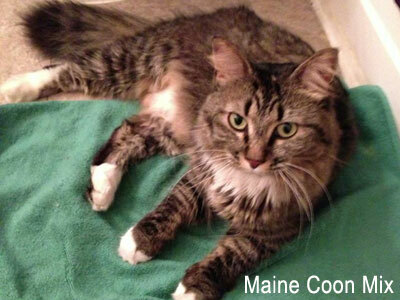 Even cats that appear to be solid colored if you look at them in the sun often have some tabby striping on them. Tuxedo Cats – These mostly black cats with white socks, white markings on their chest and sometimes symmetrical or asymmetrical markings on their face are a favorite of ours. They look rather stately and have a very sweet and mellow personality. We hope this helps with identifying your cat or a cat you may have found and are looking for the owners of. Remember that if you have Lost or Found a cat, many people get these breed/colors wrong so follow up with other questions and go see them in person if other things in the description match your pet.